The 2016 Energy Storage Summit is the place to find them. A lot has unfolded in the world of energy storage since this time last year. The largest purchase of a storage company occurred when French oil and gas giant Total bought Saft for $1.1 billion. California put itself on track to surpass PJM as the largest U.S. storage market, while deploying storage in a wider variety of scales and applications. Massachusetts is poised to announce a storage target of its own, and New York City already has. Overall, energy storage is becoming a more bicoastal industry. And then the nation elected Donald Trump as the next president, which has everyone questioning the future of energy policy. With all these changes afoot, the second-ever Energy Storage Summit is coming to San Francisco December 7 and 8 to make some sense of all the noise. The event’s 25 panels, case studies and presentations with more than 70 speakers from the industry will home in on the pathways to expand and create markets in the years to come. Trump’s election has thrown the nation’s climate and energy policy into a realm of uncertainty, but the storage industry has less to worry about than others from the change in administration, said Ravi Manghani, director for energy storage at GTM Research and the maestro behind the summit. That’s because most storage policy has been led by the states, and those states aren’t faltering in their attitude toward energy storage. But growth rates could certainly be impacted by a reprioritization of energy policy at the federal level. "There's a scenario in which investments are taken away from renewables and the Clean Power Plan, and that could lead to lower interest in energy storage," he said. "Similarly, in another world with different White House leadership, there may have been storage-related federal programs building on the White House summit this year, or the DOE's Grid Modernization Initiative. So, that aggressive growth scenario gets tempered down, purely judging by campaign rhetoric." The first section of the Energy Storage Summit will take the analysis further into the future, for a high-level discussion envisioning what the industry will look like in 2030. Given current growth trajectories, that future reality should look unrecognizable to the state of the industry now. That glimpse into the future will unfold in a conversation between Tesla Energy's Mateo Jaramillo, vice president for products and programs and a leading force behind the Powerwall and Powerpack, and Sonnen's founder and CEO Christoph Ostermann. Sonnen's residential battery was hailed by some as the potential "Tesla Killer" when it arrived in the U.S. from Germany last year. 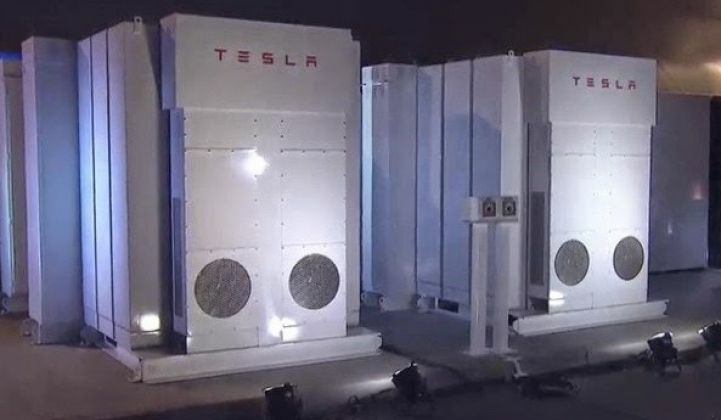 That said, competition among storage vendors has remained moderate as the industry scales up, and Tesla's main focus is pushing out the utility-scale Powerpack, despite all the buzz surrounding the residential Powerwall. The differences between the two companies are more in their approach: Sonnen has kept its focus on the home, and linking up homes into a community that can sell to the grid, while Tesla veered toward the massive scale with its Gigafactory and Powerpack contracts. The afternoon summit program splits into two tracks: how behind-the-meter storage can best serve both customers and the grid, and peering into the future of front-of-the-meter storage for utilities and wholesale markets. Day 2 dives in deep on the details, starting with each step of the supply chain needed to scale to a gigawatt-plus market. Things will heat up in the afternoon with a startup speed pitch session moderated by Greentech Media's inimitable editor-at-large, Eric Wesoff. The conference will close with an investigation into the evolving role of financing in the growth of the storage industry. The industry is on track to keep growing, despite whatever happens after January 20. By convening top leaders and thinkers from the world of energy storage, the summit promises to shed some light on the path forward. The U.S. Energy Storage Summit will take place Dec. 7-8 in San Francisco. Learn more here.